Sarah Rich and Nicola Twilley, founders of the Foodprint project, respond to my questions about built environments, physical networks, food behaviors, the role of design and if food can ultimately help reshape the new American city. IG: Founded by both of you, Foodprint Project is “an exploration of the ways food and cities give shape to one another.” You have already held events in NYC, Toronto, and Denver, and Los Angeles will be your next stop. Can you talk about how the project was generated and why you chose those cities as the initial places for the events? Do you approach each one uniquely when planning each event? SR: We came up with the idea on January 1, 2010, after talking about wanting to collaborate on something that would marry our mutual interests in food and design/cities. We chose New York initially because it’s a very fertile ground for both subject areas on their own, as well as for the intersection of the two. Also, Nicola was living in New York at the time and we have a lot of connections in the city that made it a bit easier to lock down venues (Columbia School of Architecture’s Studio-X) and other basic needs without a tremendous cost. We found fantastic panelists and the event proved to be a much greater success than either of us could even have imagined, with a turnout about three or four times greater than we’d anticipated. So that fueled our courage to keep going, and our belief that there is interest for this kind of approach to thinking/talking about food (which is to say cross-disciplinary, somewhat unexpected). Toronto happened on the encouragement of some friends there who said there’d be a lot of interest in that community. Denver happened on the invitation of Adam Lerner, the director of the Museum of Contemporary Art, who asked us to do a Foodprint program as part of a larger event exploring food and art. For New York and Toronto (and probably for Los Angeles), we had a sort of programmatic/thematic template for the events, which was to have 4 panels with the same basic topics in each city. However, the people and the cities definitely made for a lot of variation within that template. In Denver we did a shorter program, with a series of brief one-on-one interviews followed by a Q&A with all of the interviewees at once. NT:For me, Foodprint Project grew out of the interests that inform my own blog, Edible Geography. The insight that inspires me (which originally crystalized through a reading of Carolyn Steel’s book, Hungry City) is that you can use food as a lens to understand the way the city works, and vice versa — and then you can use that understanding to design a better food system and a more resilient and sustainable city. At Foodprint Project events, we try to bring together people who work with food and the city from completely different perspectives and engage them in a conversation that explores the relationship between a city and its food, and — we hope — opens up some new ideas or possibilities for improving that relationship in the future. 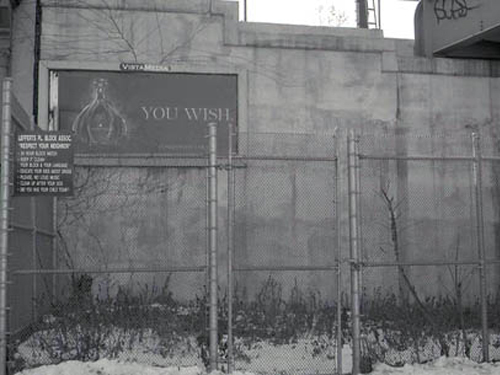 While the format was similar in both Toronto and New York, the conversations and the kinds of participants were quite different, which is something that emerged from our research into the particular challenges and innovations already under way in either city. As Sarah mentions, in Denver we tried out a different structure, which was to look at a single theme — meat — at a variety of different spatial scales, from muscle mapping and the slaughterhouse to prairie landscape and the geopolitical structures shaping international commerce and regulation. 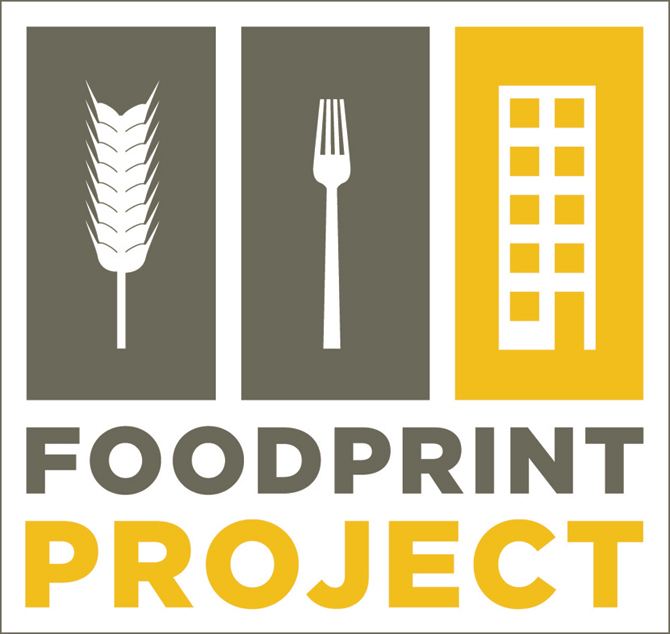 For Foodprint LA, we’re brainstorming other format changes (like adding workshops, or a tour) that will extend the project’s impact. IG: What are the common elements that you are beginning to find across those cities and what are the cultural, economic and social differences that are emerging? SR: There’s definitely a lot of work being done around food access, facilitating systems to get healthier food to all residents of a city regardless of their socioeconomic status. There’s also a lot of entrepreneurship, people earning livelihoods through small-scale farming or incubator kitchen businesses or food production. There’s obviously a strong focus on the local in each place we go. IG: Can our relationship with the built environment determine the way we relate to food? In other words, can physical spaces influence food behaviors? SR: I think they definitely can. I mean, at the most basic level, the design of a restaurant has a tremendous impact on the overall dining experience, and that expands outward to the rest of the city. I think a lot of people choose what and how to eat based on physical and mental states they might not even be aware of on a conscious level, but those states are often created by the environment in which we are working, living, etc. A light-filled space, a noisy space, a cold space, a city without greenery, a public park, a traffic-jammed street corner — we are affected by any of those environments and the way we eat when we’re in them is inevitably a part of that overall influence. IG: Do you find that food networks are able to ignore boundaries (political, physical, etc) that other networks might not be able to? Or do you think that the production, processing or consumption of food is subject to the same forces? Are there any other boundaries affecting food that are not relevant to other networks? SR: I think food systems are definitely related to and influenced by political and economic forces. A food desert, for example, is absolutely a result of the fact that big grocery stores do not trust the potential of a profit if they open in a low-income neighborhood (which is usually also a largely minority neighborhood), so they stay out of those areas, which means those residents can’t get adequate nutritional variety, which leads to disease and so on. Likewise food processing/manufacturing, because it has a large footprint, doesn’t generally happen in urban centers. Industrial agriculture lies outside of cities, but tremendous infrastructure is required to transport it in, and usually those veins of transport have bearing on the neighborhoods by which they pass. It goes on and on. 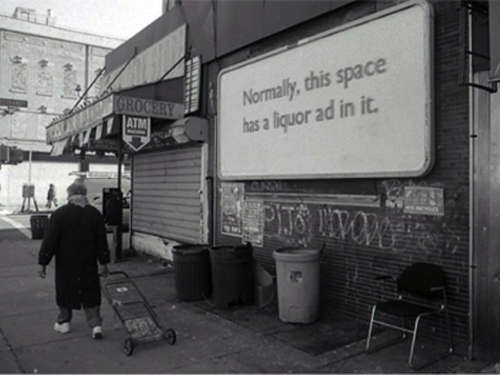 As far as consumption, I think one of the major forces is marketing and advertising, which is also connected to physical space and geography, because ads are targeted. 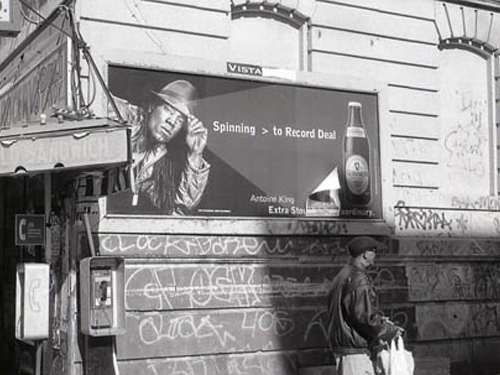 Alcohol ads written in Spanish pop up on billboards in San Francisco’s Mission District — how does that relate to rates of alcoholism in that neighborhood, or underage drinking? IG: In Nicola’s article “Fatbergs” , we follow Rob Smith, head flusher at Thames Water, through the sewage system of London. Throughout the visit, it becomes evident how food and human behaviors are transmitted literally into the city systems. It goes on to explain that “one of the worst areas for Fatbergs, for example, is Leicester Square, where cheap restaurants illegally dump used cooking oil,” while “in some exclusive areas of London, you can pick up the smells of some rather expensive bath oils.” What are other interesting connections between food and our physical networks that we might not think about? 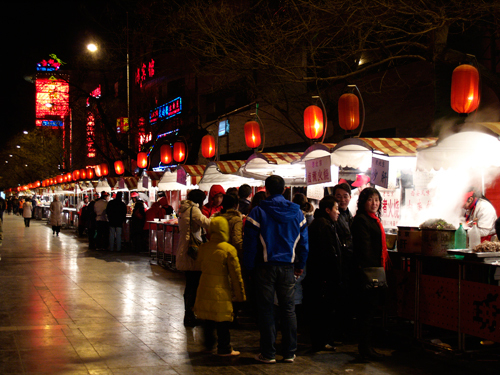 Can food reveal something unexpected or new about the cities we live in? There have been plenty of examples of that kind of insight, whether it be analyzing the complicated spatial legacy of meatpacking districts in Toronto and New York City, or the evolution of steakhouse design in Denver. IG: Projects like the Mobile Food Collective in Chicago by Archeworks are proposed as a way to address the problem of food deserts and ease the situation in some communities. What could be the steps to reverse this trend and help establish a new network of healthy food in these communities? SR: You have to create access, but you also have to create demand/desire, which means providing the information and education required to know how to prepare foods that may not be familiar, what the benefits of eating them might be, and of course, making them taste good. If someone’s been eating fast food for twenty years and you want her to start eating carrots, you can’t just hand her a carrot and expect everything to change. I also think this starts with reforming school lunch programs, so kids develop taste and understanding for healthy food at a young age. IG: To improve the food system in the US, there are a series of aspects that need to taken into account in a comprehensive way as they are closely interrelated: education, policies, and economy, to name a few. Where can the design field start putting its effort in order to improve the food system? SR: At a small scale, I’ve seen some interesting examples of redesigns for nutrition labels and other informational material to help people make better sense of what they’re consuming. I think designers can have an effect with communication of knowledge on that level. At a larger scale, urban design could accommodate more opportunities for growing food, and design could also be used to change people’s relationship with food — many urbanites feel uncomfortable picking an apple off a tree in a public place and eating it, which is sort of amazing but true. How can design reunite us with the original source of food, making us feel more comfortable eating a whole apple from a tree than sliced apples from a cellophane-wrapped, gas-filled plastic carton? IG: The industry of food has helped to shape cities, both physically and its economy for centuries. In Chicago, the Union Stock Yard, opened in the mid-19th century, became a major aspect of its economy, helped by the development of the railroad transportation. What are the new ways in which food can help reshape the new American city? What is the next food revolution that will significantly impact our cities? NT: We have spent the past one hundred years pushing food to the outskirts of our cities: I think we’re going to spend the next decade or more bringing it back in. Several of our panelists talked about mobile infrastructure and questions of scale: flexible innovations that can make the most of limited urban space and tie producers to consumers much more closely despite the density of the city environment. In my optimistic moments, I think we’ll also see a growing trend toward bio-regionalism, tying cities to their productive hinterlands to boost resilience and assume shared responsibility for watersheds, etc. One of our speakers in Toronto, Evan Fraser, spoke very interestingly about the need for storage. In the face of price spikes and key commodity shortages, cities will have to invest in food storage rather than the market-driven just-in-time logistics supply chain we rely on at the moment. IG: During the last few years, designers have often proposed ideas and designs with food as a focus. 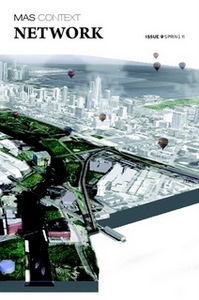 Some of those proposals tie the production of food to existing transportation infrastructures of the city, overlapping activities to an existing network. Just to give two examples, “Loop Project” by Garofalo Architects, proposes a self-sufficient agricultural system over the entire system of the train track, or “Carbon T.A.P.” by PORT, winner of the WPA 2.0 competition last year, uses a “system of industrial scale algal agriculture to sequester and consume greenhouse gas emissions while simultaneously creating a new economic resource through the production of oxygen, biofuels, bioplastics, nutraceuticals and/or agricultural feeds”. What are the possibilities of overlapping food uses in existing networks? NT: That’s where I see the most potential. To return to your earlier question about food deserts, one of the most interesting solutions in Chicago involves tweaking Walgreens stores, which already have a solid inner city footprint, to sell fruit and vegetables, drawing on maps that show where the need is greatest. That’s an initiative that marries detailed spatial information about a lack of access with an existing network of spaces that require minimal redesign to accommodate the new product. I see too many lovely architectural renderings of brand new single-use food markets or urban farms, when in fact I think architects should be operating as spatial detectives, finding existing, underutilized opportunities within the built environment, and reprogramming them accordingly. Sarah Rich is a writer, editor and new media entrepreneur. She is a co-founder of Longshot Magazine and the Foodprint Project, a former senior editor at Dwell and co-author of Worldchanging: A User’s Guide for the 21st Century. Nicola Twilley is the author of the blog Edible Geography and a freelance writer with work published in GOOD, Dwell, Wired UK and more. She is also co-director of Future Plural, co-founder of the Foodprint Project and co-curator of Landscapes of Quarantine.